1. It has strong technical capabilities that customers call on more and more often as their own technical knowledge is lost to down sizing and retirement. The area of metallurgy on wear parts is Pace engineering's greatest strength and one of the weakest found in our customers. The wear resistance and strength of any part is based on the selection of material and heat-treating process selected. Pace Engineering has a complete heat-treating facility and laboratory, the only machining facility with a complete heat-treating facility among our competitors. 2. The second advantage that is quickly becoming the most important is through put. This is the time it takes from receipt of an order to the time a part is shipping. With depleting inventories and/or long chains of supply, through put is fast becoming Pace Engineering's greatest advantage in aftermarket orders. 3. The third advantage is that the costs of manufacturing in the heart of the rust belt are rising slower than the other parts of the United States. This combines with the weak dollar are strengthening our competitive position in North America and against developed country imports. The major concern with any relationship is that both parties must benefit from the relationship. Too often, relationships become totally one sided, and one party loses. The spirit of an alliance is that both parties are to mutually benefit. Pace Engineering has worked closely with many customers over the years on product design, material and heat treat specifications and cost reduction engineering alternatives. This is a free service that has taken place at our facility, at our customer’s facilities or in the field. 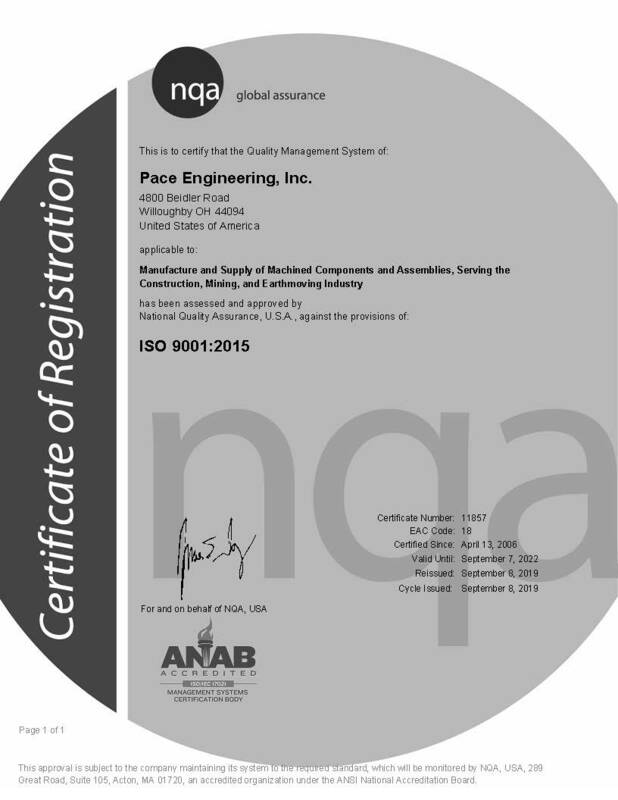 Pace Engineering, Inc. has a number of continuous improvement programs with its customers. These include assisting on cost effective designs on new products, reducing lead times, reducing inventories, reducing global costs such as trucking or planning costs. No two customers have the same objectives at the same time, so we have many different programs occurring simultaneously on a wide variety of projects. Each cost saving program is customer specific. The general parameters include the goal and the milestones and their associated dates. We set up an Excel spreadsheet to track all activities and results that is emailed weekly to all members of the team involved. The team normally involves two people from our customer and two from Pace. All aspects of the total cost are explored. In the past, direct manufacturing costs have been less than a third of the cost savings. We have entered into an alliance agreement with A.M. Castle & Co. which includes, but is not limited to fixed pricing, market variable pricing, protected inventories, stocking of specialty materials, rapid delivery mechanisms, specialty processing and delivery requirements.